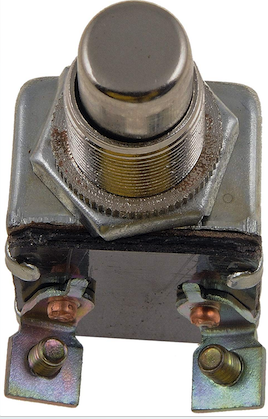 I am going to use simple push button to use as a start button without a kill switch. I am need to pull the wires from the assembly but I don't know which which wires to connect. I'll get a new assembly later, but for now I am in a pinch and I need to do it this way. I know this is probably super simple for most people, but I get nervous with anything electrical that I am going to do something wrong.Anyone able to draw up a simple digram for me to follow? it would be super helpful. It outputs 12V to the starter relay via the black/yellow wire. I see the wires you speak of and I think I see what I need to do. This temp switch will get me home from where I am because I am not going to keep push starting with all my gear and stuff. I'll do a proper repair when I get home. Thank you. The button wires (black/green) will go to new button. The red kill switch lever is blown out of the assembly, so will I need to connect the two kill-switch wires together as well? 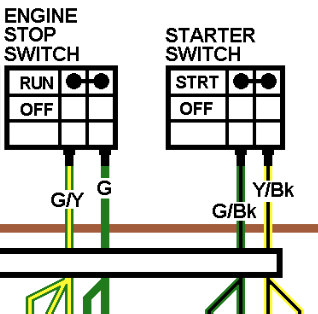 This show what needs to be connected to run and what is connected to start, if your wiring colors are the same. That looks like what I've got. Thank you! Switch hooked up. Bike started. Time to get on the road and high tail home and get this fixed proper. Thank you for helping me get unstuck. » Can You Really Kill Someone Holding a Pillow Over Their Face?